This entry was posted in Gyratories, Infrastructure, London, Pinch points, Sustainable Safety. Bookmark the permalink. 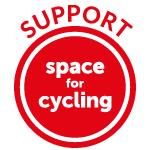 Transport Initiatives and PJA developed options for TfL for improving conditions for cycling in the area some years ago but they were never taken up. PJA took the thirty [thousand, presumably] pieces of silver, delivered the report and then quietly stood by while its contents were scrupulously ignored or left unread I’m guessing? Haven’t downloaded this specific one, but that is the standard practice. Why would they be ‘hugely disappointed’ by the successful operation of their own business model or, indeed, historically that of their whole industry? Will there come a point when they refuse to facilitate this bread-and-circuses act any further or overtly call out such wastefulness? I somewhat doubt it—don’t want to bite the hand which feeds them, etc. Which budget is all this allocated to? During the consultation for the LCN10 cycle ‘superhighway’ re-bodging, I was looking for the minutes of the TFL board meetings where they decided to prohibit its routing along the A10 (clowns didn’t even fully adhere to this at that stage). In the process, I stumbled upon a bundle of more-or-less contemporaneous scanned paper letters—tens of copies each of which had apparently been crisscrossing hither and thither in the snail mail, between the brass of various London councils. In them, they were formulating a unified position for expectation management and press lines for adoption when the then chairman of TFL—painted as a weird maverick aberration—had been replaced and they could get back to cycling-hostile business-as-usual. Everything they have done since 2016 has been consistent with this, so clearly more emotional investment in that than the totality of all these busywork reports that get commissioned and immediately shelved. Have you raised this with Michael Barrett? I believe he only deals with safety during ongoing construction projects and roadworks, not with the poor outcomes of completed schemes. He does a great job though. I used to work near Victoria and visit infrequently now. I agree it is a terrible place for cycling (or walking or even – heaven forbid – driving). The fact it has been more or less constantly under construction for 15 years doesn’t help. A little further along, Victoria Street forms a barrier to safe cycling, all the way from the gyratory to Parliament Square. It strikes me that a very simple intervention would be to allow bikes to go straight across from Broadway to the top bit of Strutton Ground, then into Old Pye St (leaving most of Strutton Ground for pedestrians & the food market). This would connect the largely quiet streets on either side of Victoria Street (and up to CS3 on Birdcage Walk), without needing to spend time on the dangerous and polluted Vic St itself.